Maria's personal iconography is the absolute height of simplicity: a single elongated crimson droplet, without any form of embellishment or artistry whatsoever. This extreme simplicity lends itself well to her more covert operations, as she is often able to 'leave her mark' in plain sight without anyone being the least bit suspicious. Maria herself doesn't look like anything special, the kind of entirely forgettable face that you could pass by on the street and never think twice about. Standing at no more than 5' 2" she is far from intimidating, not even looking like the sort of person who would have an Aura let alone put up any sort of fight, yet looks can be incredibly deceiving. Maria also has a second face, this one significantly more memorable and theatrical -- that of "The Lady". 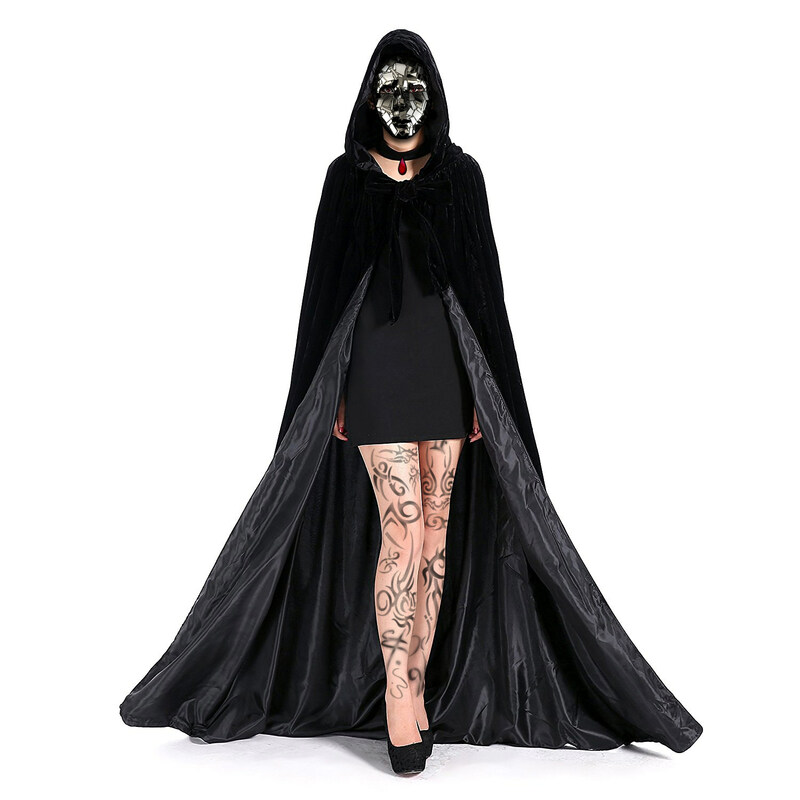 The costume is mostly simple, common elements: the short black dress, the long black hooded cloak, the high heeled shoes, but the uncommon elements of the mirror-shard mask and blood drop shaped ruby pendant give it its true presence and mystique. The mask's shape (1) (2) (artist credit) is highly off-putting, its uneven lip and jagged outline giving most people who look at it no small degree of discomfort. It also incorporates a built-in voice modulator, rendering Maria's normal voice unidentifiable while she's wearing it. The costume may seem entirely impractical for fighting, and that's because it is. Maria typically only presents herself as "The Lady" when dealing with clients, preferring to reserve the theatricality of her alter ego for when it has the greatest impact. When expecting a fight she tends to dress very simply and practically, aiming to avoid impeding her agility but otherwise catering her appearance to whatever job or confrontation she's preparing for. She seldom wears armor of any sort, given that should her Aura go down it's no guarantee of protection for her in the slightest. 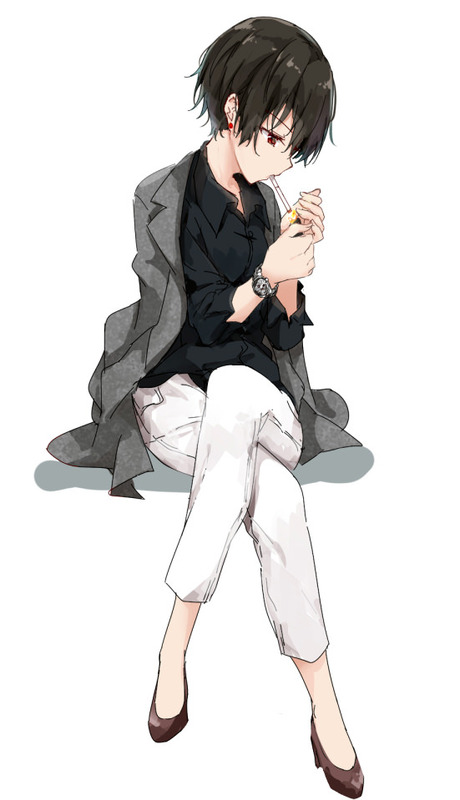 Most of her outfits, whether as "The Lady" or for doing business, incorporate at least a few hidden pockets to help conceal the tools of her trade. The elaborate tattoo patterns she wears on her legs and upper arms are semi-permanent, the ink incorporating a very high end formula that allows it to bond to various forms of purified Dust before application. Utilizing one of these "hidden weapons" will cause it to glow the color of the respective Dust element for the duration of use -- usually only a very short time -- before "burning away" into a fine mist, leaving behind skin that is raw to the touch for several days but otherwise perfectly healthy. Maria is VERY careful to cover up her arsenal when not "in character" so as to avoid being identified; on those occasions where she knows it can't be helped she'd typically opt to expend her tattoos and have them reapplied later (a very costly but sometimes necessary choice) than run the risk of her alter ego being revealed. Only an expert looking very closely (or someone with the ability to detect Dust) would have any clue that the tattoos were anything more than normal body ink without seeing them in action. Maria, born as Anya, grew up in an extremely unhealthy Mistrali home -- her father was always either drunk, broke, or coming home late reeking of strange womens' perfume while her mother mostly alternated between screaming, crying, and storming out of the house. Though neither typically directed their conflicts in her direction, it did happen from time to time. Outright abuse, however, was far less common than "forgetful" neglect, including "forgetting" to take little Anya for regular check-ups at the doctor. This, without a doubt, was probably why the symptoms of her illness went undetected for so long, only to finally come to the fore one night at dinner when she accidentally bit the inside of her cheek... and the blood kept running into her mouth for over an hour of crimson coughs and coppery swallows. The panic at the uncontrolled bleeding finally led to her seeing a specialist, whereupon she was diagnosed with a rare, progressive form of hemophilia that would only get worse as she aged. The treatment involved injections -- every other month at first, but by the time Anya was in her teens were quickly becoming a weekly tribulation. And that wasn't all that changed as she grew. With their recent divorce becoming a messy and grim affair, the legal system finally had to intervene in Anya's upbringing and remove her from her parents' custody. She was instead entrusted to an uncle on her mother's side who had distanced himself from the family's dysfunction many years previous. Uncle Fraus was, oddly enough, the most stable and upstanding person in the entire family; the court regarded the fact that he helped run a travelling circus group more as a quirk than as a concern, and he did indeed see to it that young Anya was well taken care of and made her way through her schooling. That was far from all he did for her, however: sparking the girl's imagination with ringside seats to the circus' performances, he gradually began training her in acrobatics, magic tricks, and the skills of a travelling performance artist. One would think that for a young girl who might need a medical intervention for a bad bruise that such a career path was tantamount to suicide, but Fraus was a man of connections and had a former Huntress who owed him a favor. There had been speculation that awakening Anya's Aura could help her body cope with her disease, but all the medical professionals had fretted about the risks of undue stress and how if Aura failed her at a critical moment the results could be fatal -- Fraus had little mind to wait for expert consensus, only seeking Anya's permission before undergoing the process. Awakening her Aura initially took a toll: Anya was bedridden for over a week while her body and spirit struggled to come to terms with one another, rendered exhausted and too frail to safely walk around unassisted. Finally, however, a sort of equilibrium settled in and Anya found herself stronger and steadier than ever. What's more, while laying in bed wishing desperately for a friend she accidentally discovered her Semblance, briefly and imperfectly transmuting a blood sample awaiting collection into a short-lived copy of herself. Were it not for the attending nurse in the room seeing the whole thing no one, perhaps least of all Anya herself, would have believed the incident to have been anything more than a fever dream. Unfortunately, though Aura allowed her to mend otherwise slow-closing injuries it only delayed the pace of her blood losing its ability to clot properly, not reverse it -- the injections were still necessary, and becoming more expensive as time went on. Uncle Fraus, while doing well by the standards of his profession, was not exactly wealthy. As soon as she finished her last year of regular school Anya threw herself full-time into preparing for a circus role, determined to help earn her own way in life... and see something of the world while she still had days left. Juggler. Tumbler. Magician's assistant. Plate spinner. Anya steadily worked her way up through the circus to become one of its top performers and illusionists, crafting an act all her own that combined feats of agility (assisted by a little Dust, unknown to the audience) and daring with illusions (often incorporating her Semblance) and theater. By the time she was twenty two "The Grand Enchantress" was one of the biggest travelling shows in the kingdoms... however, it was also one of the few still going. Travelling circuses were gradually becoming a dying breed; as modern technology surged ahead people began to care less and less for live performance, and the costs of running a circus were rising as well. As they went from village to village the circus had to hire Huntsmen, Huntresses, or just simple mercenaries for protection in case of Grimm or bandit attacks, nor was moving an entire troupe plus animals, tents, and equipment a cheap proposition, whether by caravan or airship. The circus' unofficial side business -- uncle Fraus' smuggling of contraband and gray-market goods, the source of much of his financial gains -- was also hitting on hard times as the SDC and its regulatory partners tightened their grip on everything they had even the slightest investment in. Things steadily grew increasingly desperate. Corners were cut, performers left to seek other occupations, and as the show down-scaled so too did its appeal. Without a large operation to conceal his other business uncle Fraus had greater and greater difficulty smuggling anything of worth, getting caught on several occasions and only avoiding years in jail by taking out significant loans to turn into bribes... and said loans did not come from good people. The circus rapidly decomposed from there, going from a big top act to smaller, private shows just to make ends meet, crossing into progressively darker shades of gray as time went on. She'd never quite remember who made the suggestion first, but the idea was floated between Anya and her uncle of using her Semblance for... other kinds of entertainment. Highly paid... very private... of questionable legality. It was a desperate moment and both swore off the idea at once, yet when the collectors came calling, bearing threats if payment wasn't forthcoming, it seemed there was little choice left to them. Both quietly agreed, saying only what little about it was absolutely necessary. Neither liked it, even as a last resort, but there was no denying the necessity. Anya bore it as well as she could, gradually learning to throttle down the feedback of sensation from her copies as a means of preserving some shred of dignity... and steadily becoming numb to her own feelings as well. It was a dark time. When she one day woke to news that her uncle had leapt to his death off the roof of a building, Anya cried for perhaps the last time in her life. Fraus had been a conman, a liar, and worse over the time she had known him... but he had also been the closest she'd ever had to true family. She considered suicide herself over the weeks that followed, just to escape the pain, but eventually decided on a different path -- a fake death. Her Semblance was still a closely kept secret, and with Fraus gone there would be barely anyone who knew what she was capable of. The trick was, ironically, in the execution; she could send a copy of herself to its "death", certainly, but there wouldn't be a corpse left to recover. What was needed was an audience, a crowd of unsuspecting witnesses to bear testimony of her "end", and a means to do so that no one would question after the fact. She spent two weeks selling off her uncle's possessions, quietly buying up as much Dust as she could. When Anya appeared at the door of her uncle's worst loan shark they doubtless expected either payment or pleading, no doubt already savoring the taste of her desperation. What they got instead was an explosion that leveled half the building and shook several city blocks on the Mistral lower levels. On that day "Anya" died, and a new, ruthless, and determined woman walked away free, cutting and dying the long auburn hair she had carefully cultivated since she was a child and adopting the name Maria Sanguine. Getting them, however, was the tricky part. Regardless of who you are, who you know, what you want, what you believe, or what you have, one thing is almost certainly true: Bloody Maria is NOT your friend. Maria is the sort who keeps her circle of close associates small as a matter of self-preservation -- the fewer you people you trust, she reasons, the fewer there are who can betray you. That's not to say she can't be approachable, agreeable, even intimate if she so chooses... but it's almost certainly just an act, yet another mask she wears to get what she needs or wants. Maria is the quintessential actress, able to adopt a persona and wear it near-flawlessly for however long she needs to keep up the act. It's important to note that she's not cruel or necessarily evil at her core, nor that she's incapable of caring about other people. She just simply puts her own survival first and foremost, and will do whatever it takes to ensure she's in a position to make it through another day. She is capable of terrible cruelty or incredible kindness, however her heart is never really in either. 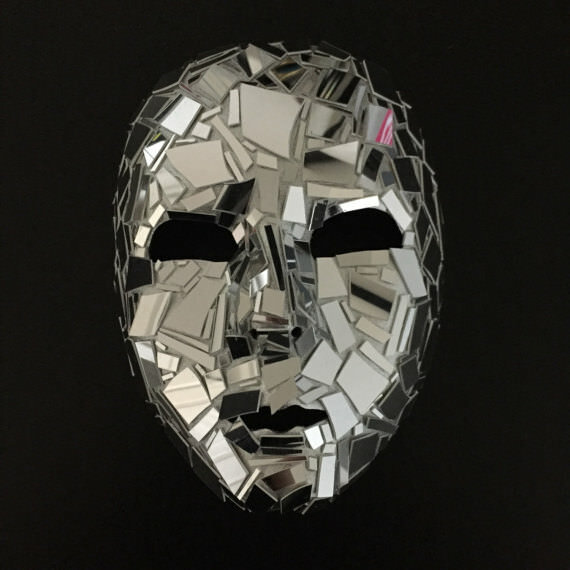 She's the true neutral -- like a broken mirror she will reflect back a thousand faces to you, and whether they be welcoming or scornful is largely a matter of perspective. In the stillness of solitude -- which she relishes whenever the chance comes along -- Maria is an unsurprisingly private and reclusive person who enjoys fine Mistrali and Vacuan teas, dark chocolate, a good book, meditation by candlelight and incense, and, strangely enough, fighting games. She has quite a collection in fact: Living Or Deceased, BurnzRed, FPL VS Wackom, Glory Tournament 7, even a classic Street Hunter 2 cartridge all feature proudly in a locked glass display case in her tiny, rundown apartment. A generous person would call her devotion to skillful button mashing cathartic, or perhaps even something of a power fantasy, but Maria mostly just finds the games to be simple, mindless fun and, somewhat more somberly, a cartoonish joke about the world's violent nature. It's worth noting that, although she doesn't let it impact her business dealings, Maria holds a deep-seated distrust of men that borders on hate and disdain. To her, men are the world's second most terrible -- and first most successful -- of monsters, the primal savagery of Grimm just barely overshadowing the calculated greed and wanton cruelty men are capable of. Then again, she also tends to view herself as having become a monster and has long since reconciled herself to that notion, more out of begrudging necessity than anything else. In Maria's view the world is little more than monsters biting and clawing one another just to avoid being trampled beneath the herd... it's a rare person indeed that makes her second-guess this paradigm. This is one of the chief reasons why she is so incredibly slow to consider trusting, REALLY trust, anyone at all. In business matters Maria positions herself as the public intermediary for "The Lady", adopting what is basically a secretarial role of booking appointments and dealing with the occasional walk-in. Most of the customers who come in through the door know that "The Lady of a Thousand Faces" is about more than just getting your palm read or checking the forecast of your stars -- such mystic preludes are kept up for appearances, though business is just as commonly discussed in frank terms behind closed doors. Still, it's not uncommon for tourists or the extremely superstitious to wander in, and to avoid giving up the ruse they are catered to as well with all the pageantry and hocus-pocus one might expect from a reclusive soothsayer. Maria is still, in many ways, an entertainer, and she hasn't forgotten how to put on an impressive show. She is a pack-a-day smoker and occasional drinker despite the added health risks it poses for her, living by her own rules and enjoying what small, temporary comforts she can. She also turns a fair bit of her profits around and anonymously invests in research she suspects could lead to a cure for her condition, hoping that one day she might finally be out from under the ever-present shadow of her bloody affliction. Maria's Aura burns a deep blood red (#660000). It is not as strong and resilient as one might find from a Huntsman or Huntress, matching more closely to the average level of Aura strength one would expect to find in an aspiring student not yet entered into the main four academies -- the reason for this being her Aura constantly being that little bit more strained from trying to keep one step ahead of her illness. In practical terms her Aura absorbs actual damage less efficiently than others (equating to an extra 2% impact from all attacks). Not only that, but the Aura's healing effect is a large part of what's holding her together. If her Aura is broken and she starts to bleed in any significant measure (a cut from a blade or claw, a wound from a gunshot, or any physical trauma that would cause internal bleeding) she risks literally bleeding out and dying if not rushed to an emergency room within thirty minutes or less. This is a big part of the reason Maria focuses on agility and relies on her Semblance to fight either for or alongside her, as well as why she comes to battle with so diverse a range of tricks up her sleeves. Her Semblance, which she calls Bloody Reflection, isn't entirely uncommon in the world of Remnant: the ability to create an Aura-based duplicate. However, hers has some fascinating and disturbing distinctions. For a start, Maria cannot simply will her doppelganger into being -- first she must bleed, shedding at least a few drops while focusing a measure of her Aura into it. The Aura-infused blood will quickly form into a mist, taking the shape and then likeness of her body, indistinguishable at a glance from Maria herself and very much able to pass for her. This process does mean that she must willfully retract her Aura, even if only for a moment, in order to draw blood; a prick of her finger or, if creating multiple copies, a shallow cut across the flat of her palm if what she usually goes with, but a cut on her leg, shoulder, or elsewhere will do just as well. Besides blood, the body double also requires a sacrificial measure of Maria's Aura flow into it; at least ten percent is necessary, but Maria can grant however much she wishes so long as she doesn't give it all away. This does, however, leave Maria herself permanently short that measure of Aura for however long she maintains the copy, only able to begin restoring her reserves if the copy is destroyed, dismissed, or makes physical contact with Maria to return however much Aura it has left to her. She can dismiss a duplicate at any distance but will only recover any Aura if the copy is making physical contact with her when it is nullified -- this restores around 3/4 of the Aura the copy had left at the time of its dismissal, the lost amount basically being a "transaction cost" for maintaining so elaborate a power. Fortunately, such a costly Semblance does have its upsides: Maria's copies share their awareness with her (sight, hearing, touch, taste, and smell), can pass for a real person (they can eat and drink, are convincing to the touch and even imitate body heat, and can give the appearance of crying or bleeding if such deception is needed), but can also operate at a distance of up to a mile from Maria herself and for as long as twenty four hours before reaching their limit and degenerating. A copy that is destroyed, dismissed, or degenerates will rapidly reduce to a hazy, person-shaped cloud of crimson haze for a moment before dispersing entirely, leaving only a few drops of blood on the ground where they were standing. Maria's copies also leave no fingerprints -- useful for deniability purposes. Maria is able to create more than one Bloody Reflection at a time, however if she tries to maintain more than two at the same time it requires an extremely high level of mental focus. This forces her into the equivalent of a meditative state wherein she cannot move most of her body or be moved without disbanding her Semblance entirely, only able to speak. Her absolute maximum is five, and every copy she creates cuts the maximum distance they can be from her (and the time she can maintain them for) by half. It is still required that each copy be imbued with at least 10% of Maria's maximum Aura, no matter how many she makes. A copy does not spawn with any weapons and will only give the appearance of having Maria's tattoos, meaning they must either arm themselves to fight effectively or rely on fisticuffs and martial arts. A Bloody Reflection can also be "infused", causing various effects. If Maria is able to acquire at least a few drops of another person's (or even animal's) blood she can use it in addition to her own when making a copy, the result being a doppelganger that is visually indistinguishable from the other person and even able to produce a match for their voice. However, physically they are the same as Maria's normal copies, matching her and not the other person in physical attributes like strength, resilience, vision and hearing, etc. One additional quirk is that the identity-stealing copy will always generate wearing a facsimile of whatever Maria herself is wearing at the time, meaning that a change of costume may well be needed if the copy is truly to pass for the original. This is Maria's most used Semblance infusion, even though it is also the hardest to use to its full potential and often requires extensive planning and study of the target beforehand to truly get a payoff from. Besides a "mixed blood infusion", Maria can also infuse her Semblance copies with anything that can play nice with air, Aura, and blood -- this includes Dust, yes, but also other substances like acid or poison if she's being particularly devious or spiteful. Usually such infused Reflections are the equivalent of walking bombs, intended only to close distance to target and then "go off" in a small (2 ft wide) burst of blood-hued haze and whatever destructive payload they were carrying -- a remembrance, in a way, of Maria's first "death". Maria must be careful about her emotional state while employing a Bloody Reflection. Though seemingly autonomous they are still guided by her will and mind; if she experiences any form of extreme stress, pain, or emotion while controlling a Reflection its appearance will warp and distend in nightmarish, horrifying fashion: pale, gaunt, and ghoulish with entirely black eyes and rivulets of blood running from cracks and gouges in the skin... a reflection of Maria's tortured deeper nature. Interestingly, Maria is able to form a copy as wearing any outfit she herself is familiar with. This means that she and "The Lady" can easily be in the same room together with hardly any forethought or planning, which is very useful for maintaining the deception that they are two separate people. In so far as combat goes, one could describe Maria as a glass cannon... but lacking the 'kaboom'. She is only too well aware of her own susceptibility and takes great pains to avoid putting herself needlessly in the line of fire. When a fight is inevitable, however, her first impulse is often to turn to her Semblance or her tattoos to create a diversion or opening that she can then exploit, relying not on strength or firepower but cunning to bring about victory. She will endeavor to keep an opponent off-balance as much as possible and get them to expend their strength chasing shadows before delivering a carefully planned strike, withdrawing to repeat the pattern until either she or they have lost too much to continue -- a strategy of attrition through evasion. To this end she leverages her highly trained dexterity for both acrobatic combat maneuvers and parkour, bringing her guns and blades to bear only when she either has no choice or a clean angle of attack. It must be noted that Mary seldom fights with the intent to overpower, or even kill. Barring planned and targeted assassinations, she is typically far more concerned with eluding threats than facing them. This goes double for Grimm, and she has virtually no experience fighting non-human creatures. If clearly overwhelmed or caught without a strategy she focuses all her efforts on escape, standing her ground only if absolutely forced to. Primary Form: Maria's Shards are small, razor-edged, mirror-surfaced throwing stars about five inches long. She keeps these weapons in their collapsed form tucked into concealed pockets in most of her outfits; her skills as a magician and illusionist means she can often produce anywhere from one to six of them at a time, seemingly just by flicking her wrist a certain way. Maria keeps herself in good supply of Shards, often carrying around fifty or more -- and stocking up even more if she feels at all threatened. 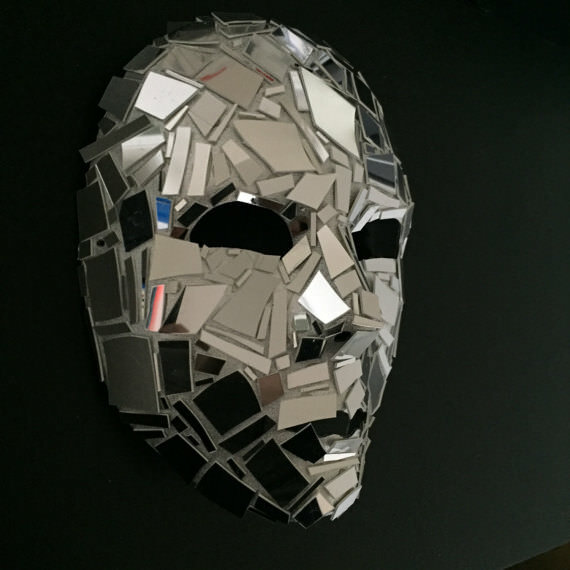 Secondary Form: The Shards collapse down into three-inch wide flat metal discs for ease of storage and concealment. History: One would think that a hemophiliac like Maria would be wary of blades, given the risk that an unexpected cut could present. However, she has in fact long since reached a sort of peace about the matter -- hard experience has taught her how to handle short blades like an expert, and during her circus days it wasn't uncommon for her to include knife throwing into her act. Her desire to protect herself from exploitation and risk has led to her desiring a means to protect herself that others won't see coming, and throwing stars suit that need just fine. Primary Form: Bloody Mary's go-to weapons for conflicts that can't be solved by a deft kick or well-placed throwing star, Chant Thrice is a trio of collapsible, concealable pistol-blades that also each pack a magnetic-action dart thrower. The weapon's primary form is a thirteen-inch single-edged short sword with a curved handle, cast in hues of dark red and smoke gray. The pistol and dart thrower components cannot fire in this form. Secondary Form: Chant Thrice's secondary form is dedicated to ranged combat; the curved handle twists to become a pistol grip and the blade separates and folds to become an under-slung bayonet, revealing the pistol barrel and rail-edged dart thrower. The pistol fires common 9mm kinetic Dust rounds and can also chamber elemental 9mm rounds, though beyond the element-specific damage output the specialty rounds don't offer any additional benefits to the weapon. In this form Chant Thrice can also fire bolt-style darts from a magnetic rail-propelled top-mount -- these darts are armed with a tiny contact-explosive tip which bursts upon meeting solid resistance (or intense heat), dispersing a concentrated hallucinogen into a two foot wide cloud for about thirty seconds before fading. The hallucinogen is Maria's emergency answer in case she's ever pursued by a human or Faunus opponent who greatly outmatches her: breathing it in causes extreme disorientation and nightmarish hallucinations for at least three minutes, even in those with strong Auras. Unfortunately, each Chant Thrice only carries a single dart and the mechanism is complex to reload, meaning that even having extra ammo with her wouldn't allow her to employ it in a heated battle. The darts can hit accurately up to 70 feet away. Tertiary Form: Chant Thrice is designed to fold in on itself into a small and compact form no larger than an expanded Scroll, making it relatively easy to conceal when not in use. History: Maria knows that she lives a dangerous life -- even with her Semblance and alter ego there will still be threats she cannot foresee, enemies who will come for her, and fights that won't be won with just a few acrobatic maneuvers and a handful of throwing stars. The trio of gunblades were quietly commissioned from a Mistrali underworld arms merchant via a string of third parties to guarantee anonymity, ensuring that tracing the weapons back to her if she were ever forced to abandon them would be next to impossible. It may seem a strange choice to have three when only two could be held at once, but assuming that is a mistake. Not only is Maria an excellent juggler (which can make for some fairly deft combat tricks) but given the limits of her Semblance she's able to arm both herself and up to two Bloody Reflections with a Chant Thrice -- a personal firing squad should things go badly. Primary Form: Until activated, Maria's tattoos appear to be nothing more than common -- if elaborate -- body ink. Only very close examination, special Dust-detecting tools, or the eye of an experienced expert in the field of novel Dust applications would pick out her swirls, wisps, and iconography as anything more than an artistic expression while they lay dormant. Each of Mary's tattoos, which range from her ankles up to her shoulders and down to her elbows (as well as one hidden away on her inner lip), is infused with extremely fine grain Dust suspended in the ink. Needless to say, something like this is not cheaply done nor do they just wash off in the shower (fortunately). Although the exact mix used is something it's maker, a Faunus going by the name Pariah, protects as a trade secret Maria knows that one of the key ingredients is a rare and highly expensive resin that's used to bond the finely powdered Dust to a blend of pigments and metallic salts. Though the patterns themselves are largely meaningless they do organize the applied Dust types, giving Mary a means of knowing how much of her "hidden in plain sight" arsenal she has left before needing them reapplied. Each use of a tattoo causes one segment to "burn away", expending the Dust and evaporating the ink all in one go -- the process leaves the skin where the tattoo was without its topmost layer, tender to the touch but quickly enough healed by Aura or just simple time. As the actual amount of Dust one can fit into a tattoo isn't very much, even with highly refined and concentrated Dust, the effects of the tattoos tend to be minor one-off tricks that Maria can pull out to surprise an enemy or get herself out of a tight spot. [GRAVITY] :: Wings of Hermes ~ Arguably the most useful of Maria's tattoos, this marking of crossed wings adorns her upper back and is comprised of thirteen segments each centered around a feather. Each segments' gravity Dust lessens the effect of gravity on her by 10% for ten seconds, letting her briefly leap higher or fall slower. [AIR] + [ICE] OR [FIRE] :: Whispers of the Four Winds ~ These Dust tattoos dominate Maria's legs in prominent, seemingly erratic swirls and sharp, hooked lines, comprising eight segments on each leg. Of these, four are purely air Dust while an added two each combine air with either fire or ice. These segments are among those with the most direct combat application, allowing Maria to turn her kicks into short-range elemental bursts with a minor knock-back effect. [GRAVITY] + [ICE] :: Cold Rejection ~ This two-segment tattoo on Maria's right upper arm takes the form of a scorpion's stinger as though rendered out of ice or frozen over, wrapping around her arm twice in a spiral pattern. Activating this tattoo channels a pulse of dark blue Dust energy down her arm and into her fingertips where it is released, generating a small one-foot shockwave of compressed cold air that's strong enough to knock an unsuspecting person off their feet. [STEAM] :: For My Next Trick ~ This seven segment tattoo of playing cards spilling out of a magician's top hat splays across Maria's left upper arm and is a call-back to her days as "The Grand Enchantress". Activating it generates a concealing burst of smoke-like white steam around her body that quickly spreads out to cover a four foot area -- just enough space to make an unexpected move such as using her Semblance or, if the chips are down, evade and run for it. [LIGHTNING] :: Electrifying Touch ~ A three-segment tattoo of thunderbolts on Maria's lower torso, this Dust tattoo is more defensive-minded than offensive -- though it can be used both ways. When activated it briefly electrifies Maria's Aura for a span of about four seconds, causing anyone or anything that comes in contact with her to suffer a mild jolt. Useful for dealing with those who can't keep their hands to themselves or to fry any tracking devices that might be planted on you... though it's best to avoid having a Scroll, for example, on your person at the time of use, as it's a sure-fire way to void warranties. Real pleasure to read, we have had similar ideas before but this is as far as someone has gone with it. Consider it's an experience freelancer I'm OK with that, although I'm curious if Anya/Maria cancels one of her clones before it is destroyed does she regain the aura spent to construct it? Now as you were probably expecting the big question is around the dust tattoos. The kind of abilities which Anya/Maria can accomplish are fine but the issue I see is their implementation. I can understand why you are hesitant to go the Hazel route with directly infusing crystals into Anya/Maria's skin given her Haemophilia but surely it would still apply to tattoos if less extremely. The second issue is how relatively easy they are to come across, I personally don't see an issue with them in their current form but I would like the process behind to be more serious that some underground tattoo artist with an online chemist degree or whatever they have. That being said I'm willing to approve it in it's current form. You've shown yourself to a trust worthy sort and if you betray that trust we can always just break your kneecaps. Noooo, my kneecaps! I need those! In all seriousness -- thanks for the feedback and approval! I'll see about getting a bit more detail and revisions in to address the points you brought up. Gah, I hate the crimson font but the profile itself should be good to go.